Even though her father, the late Johnny Copeland, may have opened some doors for his daughter, Shemekia Copeland has been causing a buzz since the late '90s with her powerful voice and commanding stage presence. Her third release, Talking To Strangers (Alligator), picks up where the 2000 Grammy-nominated CD Wicked left off, as Copeland pushes her musical aspirations farther than ever. Produced by the legendary Dr. John (who plays on every track), the record takes elements of R&B, rock and roll, soul, blues with a touch of New Orleans ‘fonk,’ and wraps them tightly together creating a nice balance of diverse influences. Shemekia draws from many wells while making the music completely her own. Shemekia Copeland might have the best chance for cross-over potential this time around, with up-beat and funk driven song "Livin’ On Love" (written by acclaimed songwriter Gary Nicholson), while the heartfelt ballad, "Don’t Whisper," could easily find its way onto the R&B charts. The singer flirts with jazz with a Billie Holiday approach on the soulful "Happy Valentines Day." One of the of the many highlights to this recording happens when Dr. John steps up to the microphone for a tasty duet on "The Push I Need." With a pre-solo Tina Turner attitude, "Pie In The Sky" is a pure rock and roll statement to wrap things up with a bang. 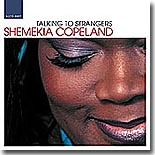 While the young singer has drawn resemblance to soul-inflected female artists such as Koko Taylor and Etta James, Shemekia Copeland is clearly coming into her own. Talking To Strangers is a testament to the 23- year-old's ability to grow and musically diversify without losing touch with her blues roots.